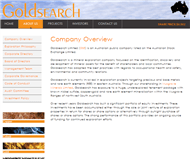 Goldsearch Limited (GSE) is an Australian public company listed on the Australian Stock Exchange Limited. Goldsearch is a mineral exploration company focussed on the identification, discovery and development of mineral assets for the benefit of shareholders and local communities. Goldsearch has adopted the best practices with regards to occupational health and safety, environmental and community relations. Goldsearch is currently involved in exploration projects targeting precious and base metals and rare earth elements (REE) in eastern Australia. Through their shareholding in Musgrave Minerals Limited, Goldsearch has exposure to a huge, underexplored tenement package with known nickel sulfide, copper-gold and rare earth element mineralisation within the Musgrave Ranges of northwest South Australia. 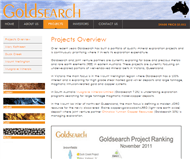 Over recent years Goldsearch has built a significant portfolio of equity investments. These investments have been accumulated either through the sale or joint venture of exploration properties in return for shares or share options or alternatively through outright purchase of shares or share options. The strong performance of this portfolio provides an ongoing source of funding for continued exploration efforts. Goldsearch is constantly reviewing the investment of its exploration expenditure as new data and information is generated on its projects. The company continues to focus on short lead-time, high priority exploration targets. New opportunities are being reviewed constantly with a view to both the generation of new projects and increasing Goldsearch’s position around existing projects. As Goldsearch is a small company with limited funds, the company seeks to attract joint venture partners in order to contribute experience and spread exploration risk in order to maximise shareholder value. Goldsearch and joint venture partner China Yunnan Copper Australia Limited (ASX: CYU) are exploring for Mary Kathleen style uranium-rare-earth-element (REE), structurally controlled copper/pollymetallic and iron-oxide-copper-gold (IOCG) deposits within the Mount Isa block of northwest Queensland. The Mary Kathleen Project is located proximal to the former Mary Kathleen uranium mine, mid-way between Mount Isa and Cloncurry. The joint venture consists of EPMs 14019 and 14022 covering 35 sub-blocks or 113 square kilometres in total. CYU met the $1.5 million expenditure commitment in June 2011 to earn 70% of the joint venture. Both parties are now contributing to the joint venture in proportion to their participating interest with normal dilution applying thereafter. The joint venture is undertaking ongoing exploration at a number of areas targeted through previous work completed by Goldsearch. During the earn-in period, CYU made two significant new discoveries at Mount Dorothy (copper-cobalt-heavy-rare-earth-element (HREE) -thorium-uranium) and Elaine North (copper-gold-cobalt-light-rare-earth-element (LREE). In addition confirmation drilling at the historical Elaine Dorothy uranium resource (renamed Elaine South) enabled a JORC-inferred resource to be calculated in 2010. Elaine is located six kilometres south-southeast of the historic Mary Kathleen uranium Mine on the trace of the Mary Kathleen Syncline. The prospect is located two kilometres north of the Barkley Highway (used currently by haul trucks) and has a high voltage power line running across its western edge. The JV has completed a multi-faceted exploration program at Elaine. Surface work encompassing detailed mapping, scintillometer surveys, soil surveys, a surface EM survey and diamond drilling led to the discovery of a new, significant sulfide body at Elaine North in mid 2011. MKED004, completed in early 2011 was drilled to twin historical percussion hole EP004 located 200 metres northwest of the Elaine South U-REE prospect. It intersected significant copper-cobalt bearing sulfides which yielded 49 metres grading 0.44% copper and 283ppm cobalt. Based on these results and further surface mapping, a northeast striking zone of copper-cobalt mineralisation was interpreted and follow-up holes were planned. MKED007 was the discovery hole intersecting significant widths of copper-cobalt sulfide (pyrite-pyrhhotite-chalcopyrite) mineralisation with gold, uranium and REE credits. Broad, low to moderate grade intersections in holes MKED007 and MKED008 include 346.7 metres at 0.28% copper, 220ppm cobalt and 0.03g/t gold from 263 metres including 122.7 metres at 0.55% copper, 317ppm cobalt and 0.08g/t gold from 487 metres in MKED007 and 188 metres at 0.35% copper, 174 ppm cobalt and 0.02g/t Au from 415 metres in MKED008. The latter zone included a high grade zone of 26 metres grading 7.76g/t gold, 0.17% copper, 488ppm cobalt, 834ppm molybdenum, 288ppm cerium and 2,861ppm uranium from 508 metres. This includes a one metre intercept of >50,000ppm uranium and 2,253ppm heavy REE + yttrium from 508 metres. Individual one metre core samples returned maximum values of 3.81% copper and 1.84 g/t gold. There are also serious REE intersections in many drillholes and the JV is assessing the potential of a REE resource/s. The sulfide body occurs on the northern side of the Elaine hill in an area of no prior drilling. It is interpreted to be curved body with a northeast-southwest strike and steep southeasterly dip. Depth to the top of the zone is modelled at 100m vertically below surface. Based on the results of MKED007 and MKED008, a fifteen hole 6,000 metre drill out occurred from August to December 2011 then recommenced in January 2012. The holes were designed to intersect the modelled sulfide body on 100 metre pierce points to enable a JORC resource to be calculated. The JORC resource is planned to be completed in the first half of 2012. For the 2011 calendar year sixteen diamond holes (MKED004 to MKED020 inclusive) for 6,942.4 m had been drilled. (Holes MKED005 and MKED006 were drilled to infill the 200 metre gap between the Elaine South resource and EP004) whereas all other 2011 holes targeted the new Elaine North zone. A maiden JORC-inferred resource is anticipated to released be in the first quarter of 2012. A JORC inferred Resource of 83,000 tonnes grading 280ppm uranium-oxide (U3O8) and 3,200ppm Total Rare Earth Oxides (TREO) at a lower cut-off of 200ppm U3O8 was calculated by consultants Hellman and Schofield Pty Ltd in March 2010. Confirmation drilling of three diamond holes for 334 metres allowed the historic drilling to be used as part of the maiden JORC-compliant resource calculation. This resource may be incorporated into future resource estimates for copper, gold, cobalt, REES, thorium and uranium for Elaine. The Duck Creek Project comprises EPM 13336 Duck Creek (ten sub-blocks, QMN 5%) and EPM 15718 Duck Creek South (two sub-blocks, QMN 75%). Queensland Mining Corporation (ASX: QMN) is earning up to 75% of EPM 13336 by spending $750,000 on exploration on this tenement. QMN will issue Goldsearch one million shares and up to five million options depending on exploration and mining outcomes. 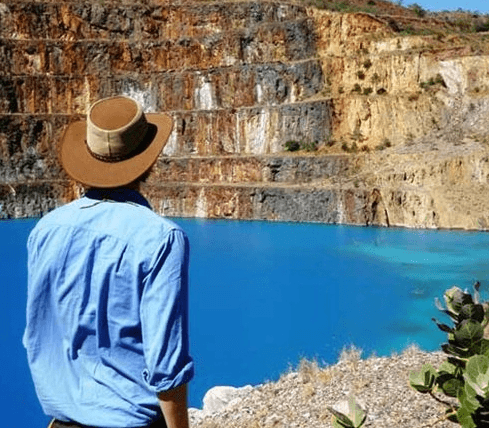 Queensland Mining Corporation has been aggressively building a portfolio of quality projects targeting significant copper-cobalt-gold resources in the Cloncurry region. The project features excellent infrastructure being centred 30 kilometres southwest of Cloncurry adjacent to the Cloncurry-Dajarra Road and Great Northern Railway Line. At least seventy known copper (± gold ± cobalt) occurrences, small mines and gouger pits (some of which are covered by mine leases (MLs)) occur within the project area, only a handful of which have been drilled. Secondary mineralization has been mined to vertical depths of less than 25 metres at Chinaman, Horseshoe, Tulip, Pioneer and Mountain Maid. Mining Leases occurring within the two EPMs are held 100% by QMN and are excluded from the joint venture. 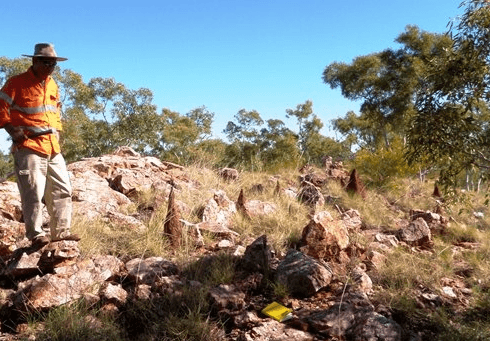 The project covers highly prospective areas within the Eastern Succession of the Mount Isa Inlier in northwest Queensland. The Duck Creek workings are located on the eastern flank of the northeast trending Duck Creek Anticline. The anticline features a core of Argylla Formation dacite, which is overlain by agglomerate and pillow lavas of the Cone Creek Metabasalt which hosts the mineralization. Dominant structural trends at Duck Creek are northeast-southwest, with at least three major sets of faults striking northeast, northwest and east-west which truncate the axial plane of Duck Creek Anticline. Copper mineralistion occurs within quartz-sulfide filled east-northeast trending structures. Initial reconnaissance work completed by Goldsearch included mapping and sampling of approximately 80 historical workings. Two hundred and thirty-three (233) rock samples collected over the EPMs and MLs averaged 1ppm gold and 3% copper. Reconnaissance sampling has indicated a much wider distribution of gold and gold copper mineralization than was previously recognised, as earlier exploration focused primarily on copper and often ignored the gold potential. QMN completed a large MMI soil sampling survey totalling 2415 samples over specific parts of EPM 13336 and some MLs in 2007. The survey defined a number of copper and gold anomalies that require further assessment. QMN completed two reverse circulation (RC) drilling programs in 2008 and 2011 testing for shallow oxide mineralisation at numerous prospects. The programs tested several prospects and historical mines on EPM 13336 and their MLs. A total of forty-four holes totalling 2,737 metres were drilled on EPM 13336 and significant results were returned from Forget Me Not, Dulce and Mountain Maid prospects, all from shallow depths. Some of the better intersections (at 0.5% copper cut-off grade, minimum 2 metre mining width and 2 metre internal dilution) include 20 metres grading 1.24% copper and 0.10g/t gold from 28 metres in DC08011RC and 12 metres grading 1.63% copper and 0.17g/t gold from 7 metres in DC08002RC at Forget Me Not. At Dulce the best result was 13m grading 1.49% copper, 0.12 g/t gold and 183ppm cobalt in DC11RC06 and at Mountain Maid several broad low grade intersections were drilled including 10m @ 0.97% copper, 0.05g/t gold and 183ppm cobalt from 22 metres in MD11RC01. Significant copper-gold-cobalt mineralisation was also intersected on several mining leases (100% QMN) including Mountain Maid and Horseshoe (e.g. 36 metres grading 2.66% copper, 0.23g/t gold and 238ppm cobalt). These mineralised zones are interpreted to continue along strike and potentially down-dip into EPM 13336. Bunyip: 300m of strike, 11 rock-chip samples averaged 0.5g/t Au and 4.8% Cu. The Mount Wellington project is located 130km east-northeast of Melbourne in Victoria. Goldsearch holds 100% in three granted exploration leases (ELs 4843, 4976 and 5046) and one lease under application (ELA 5232) which comprises the Mount Wellington Project. The project area covers a northwest-oriented geological corridor between the Jamieson River and Licola village spanning a distance of over 40km and covering an area of 41,600 hectares. The project lies within the Victorian alpine region where gold was first discovered in the 1850s. This district is currently undergoing a mining revival with Morningstar Gold (ASX: MCO) commencing production at the Morningstar Gold Mine and A1 Consolidated Gold Limited starting underground development at the A-1 Gold Mine, both of which are located near Woods Point immediately adjacent to Goldsearch’s tenements. Exploration work completed by Goldsearch and previous holders has defined a number of mineralised areas, most of which have not been drill tested. The project area covers the majority of a belt of well mineralised and, in places, pervasively altered Cambrian-aged calc-alkaline volcanic rocks. These rocks comprise intermediate to felsic volcanics and sediments which have tentatively been correlated with the highly prospective Mount Read Volcanics of western Tasmania. The volcanics are overlain by a sequence of Silurian and Devonian sediments. Detailed geological mapping identified a number of diorite dykes which cross-cut the Cambrian sequence and are undeformed and unaltered and therefore interpreted to possibly be Devonian in age. These dykes have similarities to the dykes hosting gold mineralisation at the Morningstar and A1 Gold Mines and a genetic relationship between mineralisation at Mount Wellington and at Woods Point is postulated. Hill 800: Inferred gold resource of 1,118,000 tonnes at an average grade of 1.5g/t gold for 52,200 contained ounces using a (conservative) cut-off grade of 0.8g/t gold. Mineralisation consists of oxide and sulfide material occurring from surface to 150m vertical depth making the resource readily open pittable. Hill 700: Located 1kilometre south of Hill 800, has similar gossans but weaker metal values. Hill 700 is currently not drilled and consequently has the potential to add to the Hill 800 resource. Prickle Spur: Located 500 metres east of Hill 800 features siliceous outcrops overlying strongly sericitic and schistose volcaniclastics. Anomalous gold and zinc at surface and in shallow RC holes. Rhyolite Creek: Gold (with silver and/or copper) mineralisation occurs as both epithermal microveins and massive sulphides in a pervasive zone of argillic altered rhyolitic volcanics. 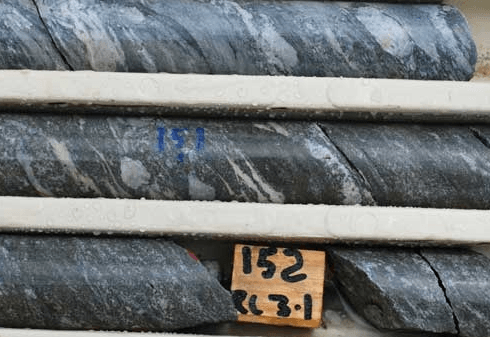 Early drilling by BHP intersected 75 metes averaging 0.2g/t gold including 31 metres grading 0.5g/t gold and 50g/t silver from pyrite altered volcanic breccias. Recent drilling by Goldsearch returned 5.6m of 2.19g/t gold, 34g/t silver and 4.71% zinc. The main shear zone with strong pyrite alteration (75 metres averaging 0.2 g/t Au zone) has only been tested by two early BHP holes and consequently 1.3km of strike length of the fault zone (30 to 75m true thickness) remains untested. Long Ridge: Surface gossans with limited outcrop extent. These are characterised by anomalous gold (0.23g/t) and base metal values (130ppm copper, 234ppm lead and 158ppm zinc) with exceptionally high molybdenum (3,510ppm). One rock sample of pyritic-silica-sericite altered volcanosediments yielded 348g/t gold, 993ppm copper and 2,560ppm zinc. Mike’s Bluff: Features altered andesite anomalous in copper and zinc within a 200 metre wide north-northwest striking, steeply dipping shear zone. Drilling by Goldsearch returned 2.0 metres averaging 1.48g/t silver, 0.42% copper and 1.1% zinc in MBD001 from the Mike’s Bluff Shear Zone. RC drilling by Mt Wellington Gold (MWG) in 1998 returned maximum values of 0.52g/t gold, 3,390ppm copper, and 11.3% zinc over narrow intervals. Violet Hill: Sericite altered and sulphide-rich volcaniclastics outcrop on the flanks of Violet Hill, in the Fullarton Window. RC drilling completed by MWG returned assays including 16 metres at 0.26g/t gold, 414ppm copper, 1081ppm lead and 1,300ppm zinc from 23 metres. Regional aeromagnetic data shows a series of intense magnetic anomalies following a general northwest-southwest trend. Each of the above prospects are closely associated with a magnetic anomaly (except for Mike’s Bluff), but the source of the anomalies, while inferred to be magnetic intrusives of dioritic composition, remain untested. Most have received little attention and those with reconnaissance work done on them feature anomalous surface geochemistry. Goldsearch believes the Mount Wellington project has potential to host large magmatic-related gold and smaller shear-hosted base metal deposits. 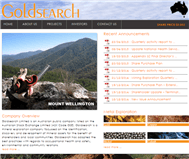 Due to major expenditure commitments on other projects, Goldsearch is currently looking for a joint venture partner to continue exploration on Mount Wellington. 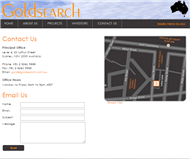 Interested parties are invited to contact Goldsearch Limited. Goldsearch originally held 16,000 square kilometres of tenements within the Musgrave Ranges of northwestern South Australia that were in joint venture between Goldsearch and Independence Group. These tenements were spun into the newly formed company Musgrave Minerals which completed an IPO on April 29th 2011 upon which Goldsearch was a major investor holding 7.2% of the new company. Musgrave Minerals control a huge parcel of unexplored ground covering the Proterozoic Giles Complex which have potential for nickel-copper sulfide, copper-gold and platinum group element (PGE) mineralisation. The General Overview, Services, Products and Projects information for this profile was last edited on 11 Oct 2016.